Female elephant seals are monitoring dissolved oxygen in the ocean. Diving almost continuously at great depth during most of the year, and covering large distance through remote areas of the Southern Ocean, Kerguelen elephant seals have proved to be a great alternative to other instruments for monitoring the oceans. The seal-derived measurements of oceanic dissolved oxygen give better results than other methods, according to new research. The current decline in dissolved oxygen concentration within the oceans indicates the effect of climate change on the sea. However the impact of its declining on marine life and ecosystems’ health is still quite unclear because of the difficulty in obtaining data, especially in remote areas like the Southern Ocean. French scientists are therefore using Southern elephant seals to monitor oxygen, temperature and salinity. 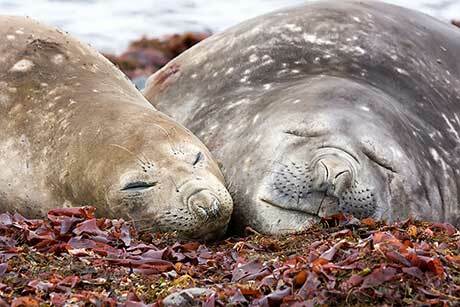 The scientists – Bailleul, Vacquie-Garcia and Guinet – attached sensors to five elephant seals. These seals delivered essential information about the water properties and reinforced the relationship between marine ecology and oceanography. As the ocean waters get warmer, the solubility of oxygen drops. The warmer ocean waters are more stable, slowing down the ocean circulation system and reducing the vertical mixing processes between water layers. The result is less oxygen transported from the oxygen-rich surface layer (in contact with the air) into the deep ocean, where zones depleted in dissolved oxygen are expanding. In addition, the slowing down of the ocean’s circulation system also results in a reduced supply of nutrients from the deep layers into the ocean surface. The low availability of nutrients in the surface layers causes the decline of phytoplankton biomass and diversity – so less oxygen proucers – and hence, the level of oxygen at surface is bound to decline further. Dissolved oxygen is therefore a very sensitive indicator of changes in properties of the marine environment, but less is known about its affect on marine life. Up to few years ago, accurate oxygen measurements were performed from infrequent and geographically-limited research vessel surveys. Recent improvements in sensor technology have nevertheless enabled a number of new bio-geochemical sensor packages to be deployed on new autonomous measurement platforms, such as profiling floats, gliders or moorings. However, despite these significant advances, some regions remain challenging to investigate using such observing systems. Because of its remoteness, regular harsh weather conditions and seasonal presence of sea ice, the Southern Ocean remains largely under-sampled by the conventional instruments: enter the elephant seals. Ranging from sub-Antarctic to Antarctic waters through the Southern Ocean, elephant seals look to be efficient assistants for delivering information. They revealed as expected the higher solubility of cold Antarctic waters to oxygen compared to the warmer waters at lower latitudes. They also provided new additional information on the properties of the different water masses through which they passed. Although not directly used by air-breathing predators, such as elephant seals, dissolved oxygen is crucial for life of many other marine organisms, such as potential fish or squid prey of seals, and its direct measurement by predators could provide essential information on the distribution and the habitat of their prey.